In order to understand how modern monasteries are organized, how an American from Michigan became a monk in the Ural wilderness and what attracts Russian youth to monasteries, RIR correspondent Darya Kezina visited the Verkhotursky Territory - the spiritual center of the Urals and Siberia. "I think that if it didn't please God, he wouldn't have consented to me being tonsured as a monk," says the 26-year-old Hierodeacon Erast, the youngest monk in the St. Nikolayevsky Monastery in the Verkhotursky Territory, a magical hinterland in the Urals, located 186 miles north of Yekaterinburg and 870 miles east of Moscow. "Now I must be strong and continue along the chosen path. No one forced me to take vows. I did it by heeding my own will." Monasteries in medieval Russia were not only places of religious worship; they were also scientific research institutes, centers of advanced technology and agriculture. In the Urals monasteries had a special significance and helped displaced people settle the remote regions of the Russian Empire. The young man made three monastic vows: poverty (monks are not allowed to have expensive possessions), celibacy (monks are not allowed to marry or have intimate relations with women) and obedience (monks must obey the church authority and cannot leave the place of service without permission). Erast came to the monastery from the Urals settlement of Fershampenuaz when he was 15 years old. He studied at a religious school, became a novice, or poslushnik (one ‘under obedience’), graduated from the seminary by correspondence, and at the age of 23 was tonsured as a monk and took holy orders. "There are difficult moments, there are temptations, and so I pray," explains Erast. "If I see a beautiful girl, I lower my eyes and walk by her. Then I shut myself in my cell and tell myself, 'Why do you need this? You're a monk. Let her go. Just let her go.'" Erast stays in touch with his relatives by using a phone and his VKontakte social network account, where he occasionally posts new photographs. Erast has a philosophical approach to the future: "I can't imagine what will happen to me in 20 years. I don't see myself as one of those wise elders or a bishop. Monasticism does not offer a career. I just want to live with Christ. For as long as I am destined to." The St. Nikolayevsky men's monastery, where Erast lives, is the oldest in the Urals. It was founded in Verkhoturye in 1604, at a time when the Russian Church was still not separate from the government. After the 1917 revolution the monastery was closed and turned into a colony. Restoration work began in 1990. Today it is an open monastery, living on church services, donations and the work of pilgrims. There are 30 monks living in the monastery, 25 religious students and about 30 pilgrims, carrying out various tasks. The St. Kosminskaya Hermitage, a men's monastery located 19 miles from Verkhoturye in the secluded picturesque settlement of Kostylev, is completely different. The local monks collect willowherb, or Epilobium, in the forests and the meadows, ferment it and make the famous ancient Russian healing drink, Epilobium tea. They also make jam from cones and wild berries. The monastery’s products are supplied to many Russian cities. Hieromonk Iona Lila told RIR that during the willowherb season the monks do shift work 24 hours a day, processing a ton of fresh leaf in one day. "We try to combine physical work and prayer as much as possible. We must always remember the ideal of the monk exerting himself in his prayers - this is what we aspire to," says the superior of the monastery, Hegumen Peter. It is difficult to doubt the trueness of the local monks' faith. They live according to the Athonite Charter (first established in the monastic community of Mount Athos in Greece in 971). Women are not allowed on the territory. The remote white-stoned cloister, surrounded by fields and forests, creates the feeling of an unapproachable medieval fortress. Only the cell tower behind the walls and the door phones allude to the 21st century. The St. Kosminskaya brotherhood began developing in 1994. Today there are 25 monks. There are former military personnel, policemen and musicians here. People come from Ukraine, Kazakhstan and even from the American state of Michigan. 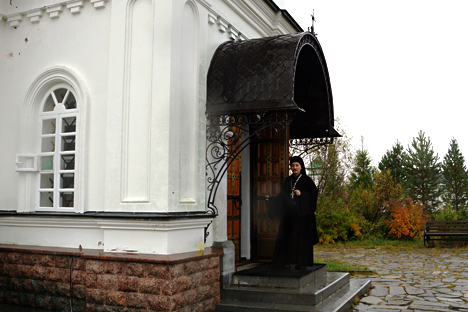 The American monk is 28 years old, and has lived in the St. Kosminskaya Hermitage for the last five years. The monastery's superiors hide this strange wanderer from journalists, but they can tell you his story. He was born in St. Petersburg and at a young age his mother took him to the U.S. There the youth entered the seminary, but when he met several Ural monks on the internet he decided to become one of them. "It's bizarre," the monks say about the American. "What was the point of going overseas, only to find his place here?" Who is capable of a monastic life? Despite the fact that the St. Kosminskaya Hermitage is a well-equipped monastery with healthy food and medical services, not that many people remain here. In the first five years, before being tonsured as a monk, a man can leave the monastery at any moment, and this will not be considered betrayal or cowardice. "If anyone could say what exactly brings one to a monastery, this person would be God," say the Verkhoturye monks. "Despair and failures never bring anyone to a monastery. And if they do, those people don’t stay long." People with criminal backgrounds are also incapable of living a monastic life, according to what the St. Kosminskaya Hermitage has witnessed. Neither is the monastery enthusiastic about accepting married men. One venerable Moscow archpriest-theologian, who has 12 children - from which two daughters are nuns and three sons are priests - said: "If it wasn't for monasticism, family life would be meaningless." In Orthodoxy it is considered that ideally there is no significant difference between family life and monastic life, and that family life is similar to a monastery. Both have their charters, their shrines and their holy events. "Therefore, if a person has a family and he comes and wants to become a monk, I tell him: Sorry, my friend, you already have your monastery," says Hegumen Peter.